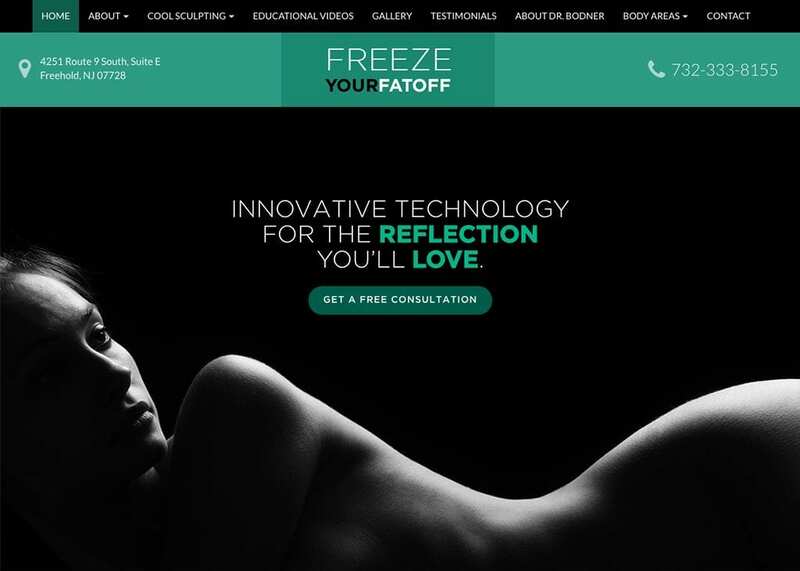 Freeze Your Fat Off is a unique practice targeting a very specific niche demographic. Its ideal patient is someone who is interested in improving their overall appearance. The first thing visitors see is the contoured image of a woman’s body with a powerful tagline boasting results the patient “Will Love.” We followed that with information about the science and background of CoolSculpting and how it works to eliminate stubborn and unwanted body fat. The rest of the website is dedicated to the testimonials of patients and physicians who have used CoolSculpting. A video education library goes into great detail about the procedure, what to expect, and the types of results many patients achieve with treatment. We also introduced visitors to Dr. Bodner and the areas of the body that are eligible for this procedure. Finally, a contact page offers guests the opportunity to schedule an appointment. For this custom aesthetic services website, we opted for a deep shade of green as the primary color. It is a cool shade that tips its hat to the types of services provided at the practice. It is also a non-threatening and relaxing color, which goes well with the non-invasive nature of the practice. This is a beautiful and sleek website that pushes the boundaries of design. It utilizes a traditional navigational menu followed by a striking header and the offer for a free consultation. Instead of focusing on the doctor or the office, the entire design is meant to spotlight the ground-breaking science behind the types of procedures offered at the practice. Since this practice offers services not typically covered by insurance, we needed to provide a strong marketing statement with this website. That is why we skipped overwritten reviews to provide real-life video testimonials of people who have experienced CoolSculpting for themselves. We also created a before-and-after gallery, which gives insight into the types of results many patients enjoy after treatment. Social media links help visitors and patients stay in contact with the practice between appointments, and a free consultation button on the home page invites visitors to step out and find out what CoolSculpting can do for them. This website projects the image of physical beauty and gives the impression that anyone and everyone can look and feel their best. The majority of the images used are of bodies that are low in body fat – something of interest to many of the patients who would visit Freeze Your Fat Off.